Please watch this video for reminders concerning TOMORROW'S field trip. 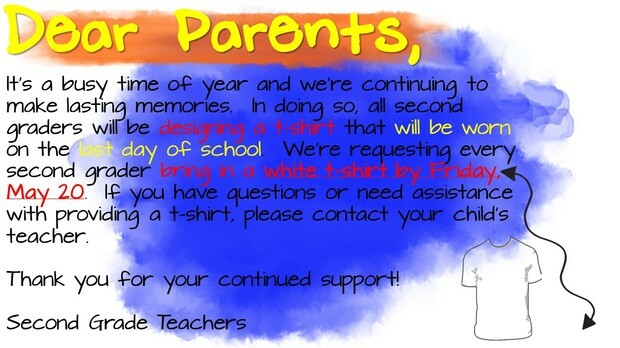 Friday, May 20th - Buddy Day; PLEASE BRING YOUR WHITE T-SHIRT FOR OUR PROJECT. THERE WILL NO LONGER BE KID-FIT CLUB CLASSES FOR THE REMAINDER OF THE SCHOOL YEAR. PLEASE PLAN YOUR TRANSPORTATION ACCORDINGLY FOR UPCOMING TUESDAYS.